Cresting a ridge in a helicopter, exhilaration rumbles up the spine of a first-timer. The trees are close enough to clip, you spook a cow being led to pasture, and the herder gawks up at you, in bewilderment. But your gaze is already on what is beyond—vistas of river valleys and roads, towns and villages, terraces marching up into forests, over and over. I am flying from Kathmandu to Timure, just shy of the Nepal-China border, but there is no thrill. A four-day walk, a day’s drive, compressed into half an hour. I scan the landscape for evidence of the catastrophic earthquake on 25 April and find it in the scatter of bright rectangles of orange and blue tarpaulins strung up around the debris of wood and brick. As we trace the road north, my colleagues and I hastily take note of the landslides likely to obstruct planned convoys of relief supplies, confirming what we’ve gleaned from aerial photos, phone calls, news reports and rumours. Before we know it, we’re descending into a narrow, rocky valley on to a grass clearing upstream from the slender sprawl of Timure, and soldiers are sprinting down the trail towards us. I try to take it all in, the suddenness of the swollen river rushing down from Tibet, a hop and a skip away; the clouds crowded along the tops of the hills; the rain pouring down on us. As I turn, the soldiers begin to walk away. 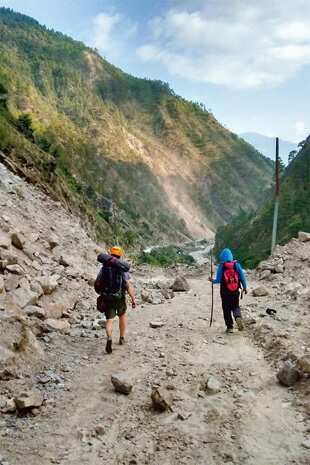 We bring no supplies, nor anyone of note, only an interest in what may be needed in this neglected corner of Nepal, to be ferried in once the rucked-up, landslip road from the capital is cleared. Down in Timure, the bucolic pleasures of village life have been supplanted by anxiety and frustration. The road to the border—the future of this burgeoning settlement—is buried, and a dozen excavators claw out boulders and rags of spent metal. Distribution of relief is fraught and strains the surface harmony of these villages. There is either too much or too little aid, and those who have enough ensure they get most of what comes in. We walk back down, sheepishly approaching the huddled villagers, and shrug, we thought it was all over but you see, no one can really tell. But we agree that we are all lucky to be alive, even if boulders have taken up residence in their front rooms and the rows of stacked rock chortens that these Buddhists venerate have been shaken to bits. Walking back from Timure, right through a cleft in the Himalayas, the beauty of sheer slopes covered with pine offer some distraction from the landslides. Quite literally, you can’t see the mountains for the stones. I scramble over flowing landslips, rocks whizzing past my helmeted head. The retaining walls have burst, the split tarmac is littered with rockfall, bridges have lurched and cracked, and I am all alone with my smartphone, a deadweight. The mountains are still beautiful, but I don’t care. Old Syafrubesi, at the junction of the Langtang and Goljang valleys, has retreated into the hills. The brightly painted, multi-decked guest houses of the new town, which is separated across ridges, are splintered and shuttered. The trekkers who gathered there to head east or west have been replaced by humanitarians discussing sacks of rice per household. Above the roar of the river, all night, the menacing trickle of a landslide barely 100m away, punctuated by the booms of falling boulders, seems too close. Now, Langtang Valley is a refugee camp in the front yard of a monastery in a nondescript new neighbourhood in north-west Kathmandu. There are 400 men, women and children clustered under tents and tarps in an area no bigger than the infield of a cricket ground. Soon these mountain people will begin to strain in a muggy stew of grief, desperation and monsoonal downpours. 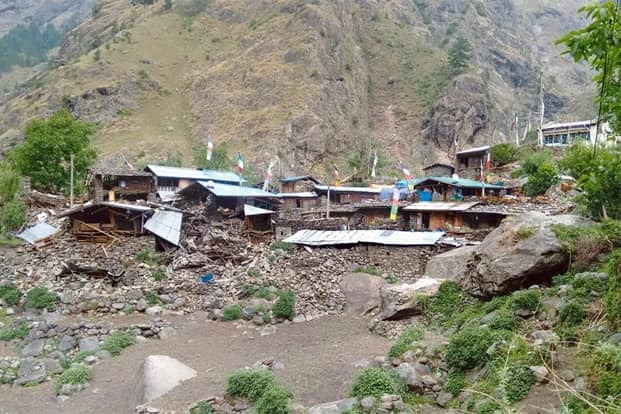 The old say they want to return to Langtang, to die where they were born. The young say they want to rebuild, and I see something beautiful happening in their valley of rhododendrons and red pandas. I tell them it is possible, that I will help them go back home to breathe the crisp, cool air of the mountains, away from the madding crowds of Kathmandu. But perhaps this is a false assurance too. Rabi Thapa is the author of the short-story collection Nothing To Declare and editor of the literary magazine La.Lit. He travelled twice to Timure in May with the Rasuwa Relief initiative. He lives in Kathmandu, Nepal.